One of the many things I like about Portland’s coffee scene is that it’s not just confined to the centre. There seems to be good coffee all over the city, especially east of the Willamette River. Such is the case with Either/Or, which was not on my original list. However, it was independently recommended to me by baristas from both Case Study Coffee Roasters and Coava Coffee Roasters as the place to go in Portland. Although quite a way south of the centre, it’s not the sort of recommendation you can ignore, so I hopped on the Number 70 bus down to the Sellwood-Moreland neighbourhood. What I found was a delightful little place that was well worth the trip. Either/Or is something of a rarity in an American market where café/roasters seem to be the established model. It’s a genuine multi-roaster establishment, regularly rotating beans from local roasters Roseline and Heart, plus Seattle’s Kuma Coffee. Denver’s Huckleberry Roasters and Oregon’s Bespoken Coffee Roasters occasionally make appearances too. While coffee’s clearly the primary focus, with two tasting flights (see Slate Coffee Roasters) on offer, it also helps that Either/Or is one of the nicest spots I’ve been to in a while. Either/Or is part of Old Sellwood Square, on the corner of SE 13th Avenue/Umatilla Street. Occupying a prime spot, it’s right on the street, but with one side facing the square. You can sit outside at one of the pairs of picnic tables, either on 13th Avenue or in the shelter of the square. Alternatively, head through the recessed front door (or pop through the side door from the square) to find yourself in a small, square and very beautiful interior. Although small, Either/Or isn’t cramped. The counter occupies the back right-hand corner, extending halfway along the back and right-hand walls. The La Marzocco Strada is directly in front of you, three grinders (two rotating guests, plus decaf) to its left (your right), a mirror on the back wall. To your right, there’s the till and cake stand, with the menu on the wall behind it. The recessed door creates two large window bays. A little kitchen occupies the right-hand one, where one of the staff, Marie, was cooking up a wonderfully-fragrant caramel syrup. The left-hand bay has a lovely two-seat sofa, plus coffee table. The remaining (interior) seating is a wooden bench against the left-hand wall with three square, two-person tables. Wood predominates in Either/Or. The building’s wooden, as are the floor, counter, furniture, window frames and ceiling beams. The rest’s painted a very light cream. The lovely, high ceiling helps create a sense of space and allows for an additional top window running the width of the store. Add another window overlooking the square on the left and the half-glazed door to the square at the back, and you have a very bright interior. When I say Either/Or regularly rotates its beans, I mean it. Barista Dave, who’s recently started ordering the coffee, gets five pound bags and when one’s gone, it’s onto the next. Two of the trio of Roseline, Heart and Kuma Coffee are represented on espresso: during my visit, Roseline’s Catapult blend (50% single-estate Panama, 25% each of two Colombian micro-lots, all separated by cultivar) and a Guatemala Finca Retana from Kuma. 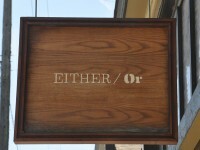 Either/Or has a very cut-down menu, with bulk-brew filter (no pour-over), latte and mocha offered in three sizes, 8, 12 and 16oz, while espresso, Americano, macchiato, cortado and cappuccino are one-size-only. Either/Or offers two flights, both coming with sparkling water and a taster cake. The espresso flight is both espressos; the beverage flight, an espresso, plus espresso in milk (macchiato, cortado or cappuccino). Dave, plus colleague Cassie, sorted me out with a beverage flight: the Guatemalan Finca Retana as espresso and the Catapult blend in a cortado. The Finca Retana was fruity, but smooth, with a slightly acidic aftertaste. The cortado was very smooth, the fruity notes of the coffee coming through really well, but not at odds with the milk, a really hard balancing act to achieve. I also tried it as an espresso, where I found it much sharper and brighter, with a real kick, too bright for my palette. Having tried it on its own, I’m impressed how well it went with milk, which really takes the edge off. The final part of my flight was a carrot and pineapple cake with peach frosting. It was lovely, with a great texture and avoided being too sweet, even with the frosting. This entry was posted in Cake, Coffee Shops, Coffee Terraces, Laptop Friendly, Portland (Oregon), Retailers, Sandwiches and tagged Heart, Kuma, PortlandPortland2015, Roseline by Brian Williams. Bookmark the permalink.